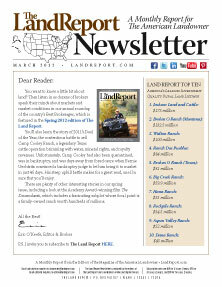 The Spring issue of The Land Report has arrived! Right now it’s en route to bookstores such as Barnes & Noble and subscribers’ offices around the world, but thanks to the miracles of modern technology you can read right now right HERE. Learn the stories of America’s Best Brokerages in our second annual survey. More than 70 are profiled from coast to coast. Find out why George Clooney has such strong ties to the land in the Academy Award-winning movie The Descendants. For more up to the minute reports on listings, auctions, sales, and breaking news pertaining to land and landowners, be sure to follow The Magazine of the American Landowner on Facebook and Twitter. Better yet, Land Report is now on Pinterest. P.S. Our award-winning quarterly magazine is available in a print version via subscription.